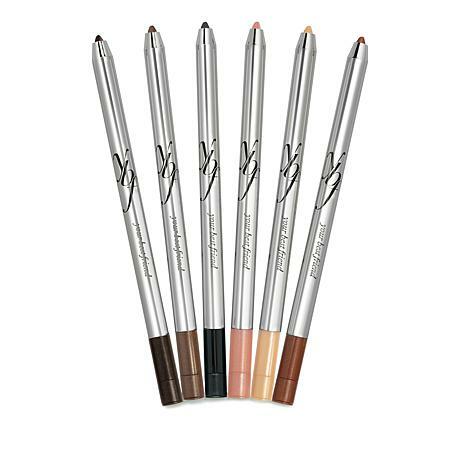 A collection of water-resistant gel eyeliners in a wide array of unforgettable, sensational shades. Use a light touch for a natural, soft line with your gel pencils. Use a firmer touch for fabYOUlously bold lines and easily adjust the thickness of your liner to your liking. Want something a little more dramatic? Smudge out the liners for a smokey eye effect that will WOW the crowd! Ingredients: Cyclopentasiloxane, Trimethylsiloxysilicate, Cyclohexasiloxane, Tin Oxide, Ceresin, Polyethylene, Propylene Carbonate, Disteardimonium Hectorite, Phenyl Trimethicone, Calcium Aluminum Borosilicate, Euphorbia Cerifera (Candelilla) Wax, Phenoxyethanol, Simmondsia Chinensis (Jojoba) Seed Oil, Persea Gratissima (Avocado) Oil, Beta-Glucan, Water (Aqua), Caprylic/Capric Triglyceride, Mica, Titanium Dioxide (CI 77891), Iron Oxides (CI 77491). Ingredients: Cyclopentasiloxane, Trimethylsiloxysilicate, Cyclohexasiloxane, Ceresin, Synthetic Fluorphlogopite, Polyethylene, Propylene Carbonate, Disteardimonium Hectorite, Phenyl Trimethicone, Euphorbia Cerifera (Candelilla) Wax, Calcium Aluminum Borosilicate, Tin Oxide, Phenoxyethanol, Simmondsia Chinensis (Jojoba) Seed Oil, Persea Gratissima (Avocado) Oil, Beta-Glucan, Water (Aqua), Caprylic/Capric Triglyceride, Iron Oxides (CI 77491, CI 77499 CI 77492), Titanium Dioxide (CI 77891), Carmine, Manganese Violet (CI 77742), Mica, Red 40 Lake (CI 16035). Ingredients: Cyclopentasiloxane, Trimethylsiloxysilicate, Calcium Aluminum Borosilicate, Tin Oxide, Cyclohexasiloxane, Ceresin, Polyethylene, Synthetic Fluorphlogopite, Mica, Phenyl Trimethicone, Euphorbia Cerifera (Candelilla) Wax, Disteardimonium Hectorite, Propylene Carbonate, Phenoxyethanol, Simmondsia Chinensis (Jojoba) Seed Oil, Persea Gratissima (Avocado) Oil, Beta-Glucan, Water (Aqua), Caprylic/Capric Triglyceride, Titanium Dioxide, Iron Oxides (CI 77499, CI 77491), Mica. Ingredients: Cyclopentasiloxane, Trimethylsiloxysilicate, Cyclohexasiloxane, Ceresin, Calcium Aluminum Borosilicate, Tin Oxide, Polyethylene, Propylene Carbonate, Disteardimonium Hectorite, Phenyl Trimethicone, Synthetic Fluorphlogopite, Euphorbia Cerifera (Candelilla) Wax, Phenoxyethanol, Simmondsia Chinensis (Jojoba) Seed Oil, Persea Gratissima (Avocado) Oil, Beta-Glucan, Water (Aqua), Caprylic/Capric Triglyceride, Mica, Titanium Dioxide (CI 77891), Iron Oxides (CI 77491), Carmine. Ingredients: Cyclopentasiloxane, Trimethylsiloxysilicate, Cyclohexasiloxane, Ceresin, Calcium Aluminum Borosilicate, Tin Oxide, Polyethylene, Propylene Carbonate, Disteardimonium Hectorite, Synthetic Fluorphlogopite, Tin Oxide, Phenyl Trimethicone, Calcium Aluminum Borosilicate, Euphorbia Cerifera (Candelilla) Wax, Mica, Dimethicone, Phenoxyethanol, Simmondsia Chinensis (Jojoba) Seed Oil, Persea Gratissima (Avocado) Oil, Beta-Glucan, Water (Aqua), Caprylic/Capric Triglyceride, Titanium Dioxide (CI 77891), Carmine, Iron Oxides (CI 77491), Red 40 Lake (CI 16035), Yellow 5 Lake (CI 19140). Ingredients: Cyclopentasiloxane, Trimethylsiloxysilicate, Ceresin, Polyethylene, Isododecane, Phenyl Trimethicone, Cyclohexasiloxane, Euphorbia Cerifera (Candelilla) Wax, Microcrystalline Wax, Disteardimonium Hectorite, Acrylate/Dimethicone Copolymer, Phenoxyethanol, Propylene Carbonate, Simmondsia Chinensis (Jojoba) Seed Oil, Persea Gratissima (Avocado) Oil, Trisiloxane, Beta-Glucan, Water (Aqua), Caprylic/Capric Triglyceride, Iron Oxides (CI 77499), Black 2 (CI 77266). I had stopped wearing eyeliner because my eyes have been watering so badly it would come off soon after applying. Tried the ybf and it is fantastic! Just like Stacey demos on TV, it stays where you put it. LOVE it!!! Only problem is getting the wrapping paper off each liner. LOL I will be buying again. I don't know why, but a lot of eyeliners I have tried become a big mess under my eyes. These don't! I am very pleased to have found these! Thank you to those of you that left reviews on these eyeliners! they were out of stock. LOVE this set.. metallic and beautiful! 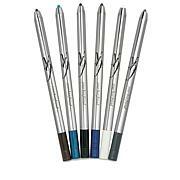 I love these, even better than"Mally's gel eyeliners. I use the pink and light coral liners as eyeshadow or liner. These are absolutely the best!They go on easily and stay on until makeup remover takes them off.I will buy them again!